Last weekend I had every intention of making a pecan dessert of some sort and then I saw Mario Batali posted a Wild Blueberry Pie recipe from his upcoming cookbook and I knew I had to give it a try. Since I was planning on pecans, and had already bought them, I decided to make a pecan crust to accompany his wild blueberry filling. What a delicious combination...this was by far the best blueberry pie I have ever eaten. In a mixing bowl, combine the flour, pecans, sugar, and salt. Mix well. Add the butter and mix until the mixture resembles coarse crumbs. Add the water and mix again. Wrap in plastic and refrigerate for at least 30 minutes. Remove the dough from the refrigerator and place it on a lightly floured surface. Cut the dough into two equal parts. Roll one out on the floured surface into a circle about 12 inches in diameter. Gently place it into a 9 by 2-inch deep-dish pie pan. Roll out 2nd half of dough for a top. Gently toss the berries with the flour, cinnamon and sugar. Sprinkle with lemon juice. Let stand 10 minutes. Pour the berries into the pie shell. Scatter the butter over the berries. Place the second crust over the pie and crimp the edges to seal. With a sharp knife, cut a few slashes in the top crust to vent. Bake for 45 to 50 minutes, until the crust is brown and the filling bubbles up through the vents. Yum, I love wild blueberries! Those blueberries have my heart and soul. Delicious! Blueberry pie is my baby's absolute favorite. I'm intrigued by the twist on the crust. Yum! Blueberries are my love language! Blueberry pie is one of my favorites! Everything about this sounds so delicious! I love blueberries and the combination with the pecan crust is perfect! I've never tried pecans in a pie crust or made blueberry pie so this is one that appeals to me. It looks wonderfully juicy! My son is in love w blueberry pie. I've never found a recipe I have loved. Perhaps this will be the one! Looking forward to it. I loooove blueberry pie, and I'm super intrigued by the pecan crust. Pass me a slice, warm and a la mode, please! Such a perfect use for all those gorgeous blueberries right now! Pinning! Fresh blueberries are the ultimate summer treat! Totally drooling at this delicious slice of pie!! This looks so delicious! Yum. Pecan and blueberry are meant to go together! This is a wonderful recipe and I can't wait to try it. Pecans are one of my favorite nut. What a treat with blueberries. Oh my goodness that looks delicious! Especially with that scoop of ice cream on the top! What a lovely looking pie! I love wild blueberries. Gorgeous! I love blueberry anything! I love the flour you use in the filling, to hold it all in; that's my favorite! OMG, pecan CRUST - sounds like you took this pie to whole other level of YUM! This looks amazing! 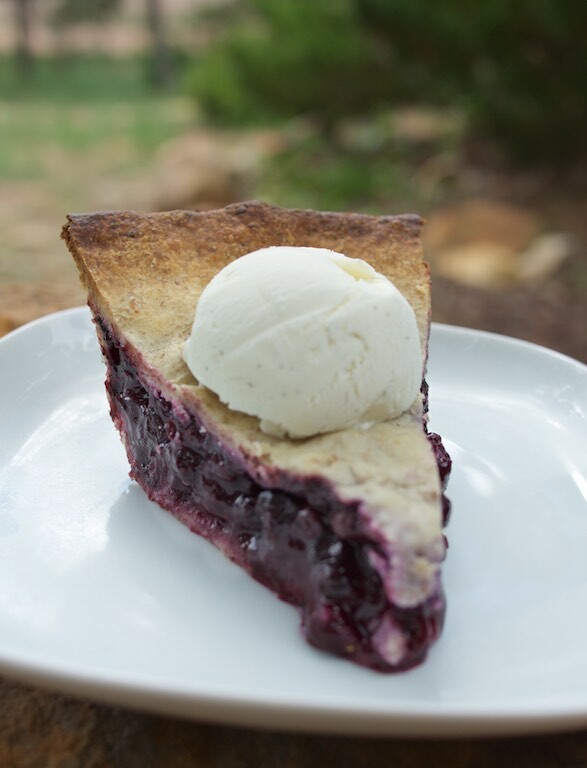 I love blueberries AND pie, so together with the pecan crust...YUM!